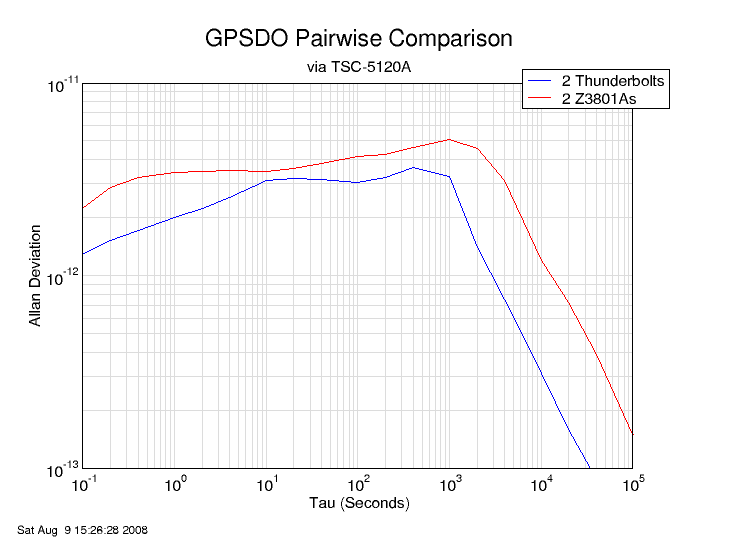 I have two HP Z3801A GPSDO and recently acquired two of the "Time-Nuts Special" Trimble Thunderbolt units. With all four running in my basement off the same GPS antenna, I decided to see how they compared, both brand-to-brand and against each other. Unfortunately, I don't have a Hydrogen Maser or a Cesium standard of sufficient stability to measure the performance of these units in a single sweep from 1 second to a few hundred thousand second averaging times. So, I thought I would measure each pair of units against each other. In theory, if both units have the same performance, measure them as a pair should work to show their actual performance, and if the two units are identical (which they won't be! ), you can obtain the actual Allan Deviation of each by multiplying the combined value by 1/sqrt(2). 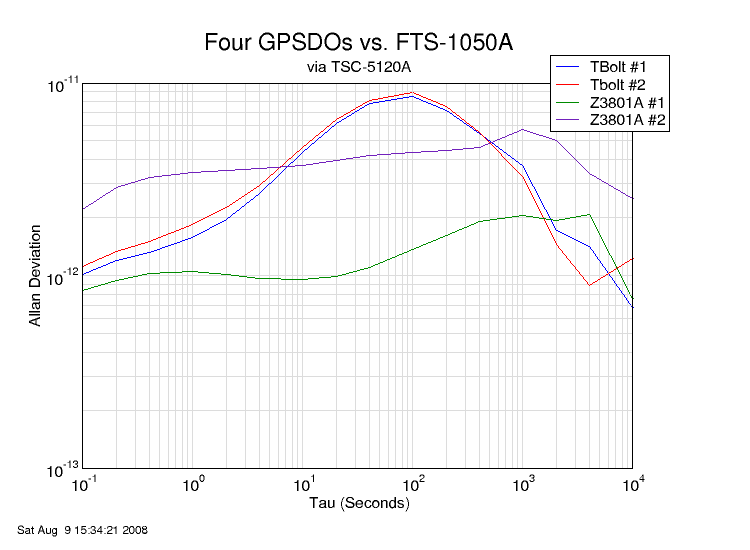 Based on this, those Thunderbolts are surprisingly good -- better than my two Z3801As, anyway. Showing an ADEV no worse than 4x10-12 isn't too shabby. Now, wait a minute. 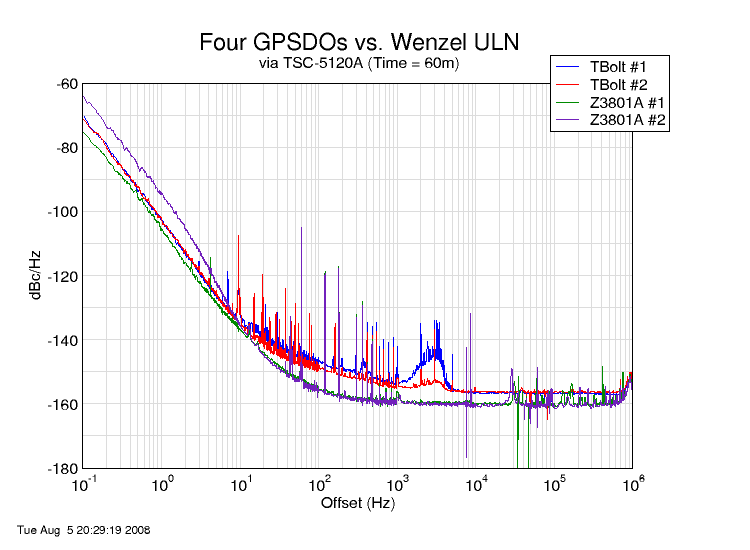 The Thunderbolts still don't look bad, staying below 1x10-11 out to 10,000 seconds, but that's much worse (relatively speaking) than the other measurement. What's going on? My best guess is that the oscillators aren't truly uncorrelated and that measuring them together doesn't provide a true picture of their performance. As a thought experiment, consider the stability measurement of two free-running crystal oscillators that have the same positive-slope aging characteristic. If both age at the same rate of 1x10-9/day, compared to each other they won't age at all.